In this essay I shall look forward to current work, the metakimospheres as we call our installations, not without placing what already in 2005 we began to think of as “sensual technologies” into a context of art/technology, dance/technology and new media art—the cross-over performance and science assemblages that are of interest here if we consider the technological arts as an important medium for contemporary knowledge production and also political intervention. Barad, Karen. ‘Posthumanist Performativity: Toward an Understanding of How Matter Comes to Matter’, Signs: Journal of Women in Culture and Society, 28.3 (2008): 801–31. Bennett, Jane. Vibrant Matter: A Poltical Ecology of Things (Durham: Duke University Press, 2010). ———. ‘Choreographic Objects: Stifters Dinge,’ Body, Space and Technology, 11.2 (2012): http://people.brunel.ac.uk/bst/vol1102/. Boehme Gernot. Atmosphäre: Essays zur neuen Ästhetik, 7th edition (Frankfurt: Suhrkamp, 2013). ———. ‘Die Kunst des Bühnenbildes als Paradigma einer Ästhetik der Atmosphären,’ in Ralf Bohn and Heiner Wilharm (eds), Inszenierung und Vertrauen: Grenzgänge der Szenografie (Bielefeld: Transcript, 2011), 109–17. Danjoux, Michèle. ‘Choreography and Sounding Wearables’, Scene, 2:1-2 (2014): 197–220. del Val, Jaime. Personal communication (2015). Diller, Elizabeth, and Ricardo Scofidio. Blur: The Making of Nothing (New York: Harry N. Abrams, 2002). Dixon, Steve. Digital Performance: A History of New Media in Theater, Dance, Performance Art, and Installation (Cambridge, MA: MIT Press, 2007). Dwyre, Cathy, and Chris Perry. 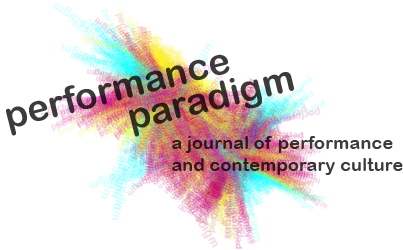 ‘Expanded Fields: Architecture/Landscape/Performance’, PAJ: A Journal of Performance and Art 109 (2015): 2–7. Forsythe, William. Suspense, exhibition catalogue, ed. Markus Weisbeck (Zürich: Ursula Blickle Foundation, 2008). Halprin, Lawrence. The RSVP Cycles: Creative Processes in the Human Environment (New York: George Braziller, 1969). Heller-Roazen, Daniel. The Inner Touch: Archaeology of a Sensation (New York: Zone Books, 2009). Jackson, Shannon. Social Work: Performing Art, Supporting Publics (New York: Routledge, 2011). Joy, Jenn. The Choreographic (Cambridge, MA: MIT Press, 2014). Krauss, Rosalind. ‘Sculpture in the Expanded Field’, in The Originality of the Avant-Garde and Other Modernist Myths (Cambridge, MA: MIT Press, 1986 ), 276–90. Kuppers Petra. Disability and Contemporary Performance: Bodies on Edge (New York: Routledge, 2004). Kwastek, Katja. Aesthetics of Interaction in Digital Art (Cambridge, MA: MIT Press, 2013). Latour, Bruno. Reassembling the Social. An Introduction to Actor-Network Theory (Oxford: Oxford University Press, 2005). ———. ‘Some Experiments in Art and Politics’, e-flux 23.3 (2011): 1–11. http://www.e-flux.com/journal/some-experiments-in-art-and-politics/. Meisenheimer, Wolfgang. Choreography of the Architectural Space, trans. Rebecca L. van Dyck and Kim Jeong-Geun (Munbal-li : Dongnyok, 2007). Munster, Anna. Materializing New Media: Embodiment in Information Aesthetics (Hanover: Dartmouth College Press, 2006). Nelson, Solveig. ‘Space Age: The Halprin Workshops’, Artforum, 53.5 (2015): 99–100. Pallasmaa, Juhani. ‘Space, Place and Atmosphere: Peripheral Perception in Existential Experience’, in Christian Borch, ed., Architectural Atmospheres: On the Experience and Politics of Architecture (Basel: Birkhäuser, 2014), 18–41. Philippopoulos-Mihalopoulos, Andreas. Spatial Justice: Body, Lawscape, Atmosphere (London: Routledge, 2015). Portanova, Stamatia. Moving Without A Body: Digital Philosophy and Choreographic Thoughts (Cambridge, MA: MIT Press, 2013). Rancière, Jacques. The Emancipated Spectator, trans. Gregory Elliott (London: Verso, 2009). Ryan, Susan Elizabeth. Garments of Paradise: Wearable Discourse in the Digital Age (Cambridge, MA: MIT Press, 2014). Salter, Chris. Entangled: Technology and the Transformation of Performance (Cambridge, MA: MIT Press, 2010). Sloterdijk, Peter. Sphären III – Schäume, Frankfurt: Suhrkamp, 2004 [partial translation: Peter Sloterdijk, Terror from the Air, trans. Amy Patton & Steve Corcoran (Los Angeles: Semiotext(e), 2009)]. von Uexküll, Jakob. A Foray into the Worlds of Animals and Humans: with a Theory of Meaning, trans. J. O'Neil (Minneapolis, MN: University of Minnesota, 2010). White, Gareth. Audience Participation in the Theatre: Aesthetics of the Invitation (Basingstoke: Palgrave Macmillan, 2013).